Modern data center managers are constantly being asked to do more with less, and a data-driven approach can mean the difference between success and failure. But how do you identify which Key Performance Indicators (KPIs) are right for your organization? How do you manage power and network capacity as well as space? Can you wait to invest in additional equipment or will you experience a shortfall of resources? And how can Data Center Infrastructure Management (DCIM) help? Best practices for efficient capacity utilization that data center teams can’t live without. Data center metrics that matter for optimal data center capacity. How Data Center Infrastructure Management (DCIM) can simplify space, power, and network capacity planning. 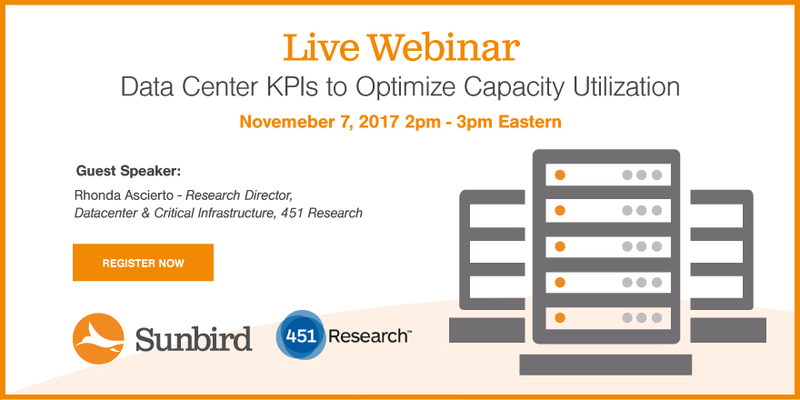 If you are just starting to identify your data center management KPIs, looking to improve your current capacity utilization efforts, or planning your next data center projects, you won’t want to miss this data center management webinar. You’ll gain the real-world, practical advice you need to better leverage capacity and delay costly capital expenditures. Register now to secure your spot. Rhonda Ascierto, Research Director, Datacenters & Critical Infrastructure, 451 Research. Rhonda will share 451 research around the strategic and tactical drivers of DCIM deployments and how KPIs can enable greater efficiencies and improve capacity management. Samer Nassoura, DCIM Solution Architect, Sunbird Software. Samer will review key DCIM use cases and highlight the dashboards and metrics that can help data center managers utilize space, power, and network capacity more effectively. Joseph Keena, Manager - Data Center Operations, University of Florida Health Shands. Joe is responsible for data center day-to-day operations as well as spearheading the implementation of new technologies. Joe will share his thoughts from over 13 years of experience with managing data center operations, including how to use DCIM software to manage asset inventory data.